1. 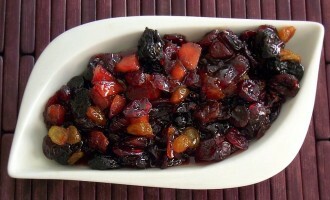 In a medium saucepan, bring the cranberries, prunes, cherries, figs, lemon zest, sugar, and water to a boil. Reduce heat and cook over medium-high heat until the cranberries burst and the water has evaporated, about 5-7 minutes. Scoop into a bowl and serve warm or cool in the refrigerator until ready to eat. Can be kept in the refrigerator for up to 2 weeks.